What is the price/earnings ratio? How to calculate the price/earnings ratio? 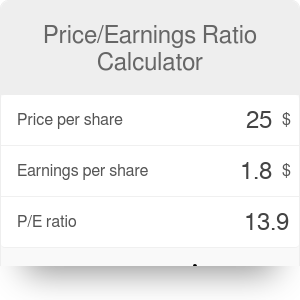 This price/earnings ratio calculator helps investors determine whether the stock of a particular company is overvalued or undervalued. If you're looking for a good opportunity to invest, make sure to read on; in the article below, we'll explain what is the price/earnings ratio and how to calculate it, as well as present a simple P/E ratio formula. If you want to analyze the stock of a company in more detail, head straight to our price-to-book ratio calculator! Price/earnings ratio - also often called the price to earnings ratio or the P/E ratio - is a finance indicator that measures a company's stock price concerning earnings per share. In simple words, it shows the balance between price and earnings from the stocks. Thanks to this ratio, we can see how profitable it is to buy shares of a specific company. Also, we can use the P/E ratio to determine if shares are over- or undervalued. For example, if you consider two companies in the same industry, but with entirely different values of the P/E ratio, it might mean that the valuation of one of them is not believable. Price per share - the market price of a stock. This value heavily depends on the supply and demand on the market. Earnings per share - the profit which a company gains from each outstanding share of common stock. If a company doesn't have any net income, but only net losses, it won't have a P/E ratio. Determine the market share price. Let's assume that it is equal to $25. Determine the earnings per share over the last 12 months. In our example, we'll set this value to $1.80. As you can see, the P/E ratio in our example is roughly 14x earnings. Now that we arrived at a result, we can try to interpret it. As a general rule, a company with a high P/E ratio is considered more profitable on the market - it means that investors are willing to pay more per share because they anticipate fast growth and higher future earnings. To determine whether the price/earnings ratio is high or low, you need to compare it with the P/E ratios of other companies in the same industry. For instance, if your company has a P/E of 14x earnings, and most of its competitors of 12x earnings, you could say that your business is considered more valuable by the market. Price/Earnings Ratio Calculator can be embedded on your website to enrich the content you wrote and make it easier for your visitors to understand your message.